New In Box KitchenAid® NSF 8 Qt KSM8990ER Bowl Lift Commercial Empire Red Stand Mixer - Work Worldwide. The KitchenAid KSM8990ER Empire Red NSF 8 qt. Commercial stand mixer is ready to handle all of your jobs, large or small up to 14 cups of flour at a time! Its powerful 500 watt, 1.3 HP DC motor is KitchenAids most powerful, quietest model available, featuring precise all metal gears and advanced electronic controls that communicate with the motor 15,000 per second for optimum torque with less heat buildup. Delivering plenty of mixing power for everything from a slow stir to a fast whip, this high efficiency motor with 10 speed slide control is perfect for use in your bakery or commercial kitchen! The Empire Red finish and all metal touch points give a professional look to any mixing station, while the 8 qt. Brushed stainless steel bowl with "J" style handle can hold enough dough for 8 1/4 loaves of bread or 13 dozen cookies at once! The unit features a professional bowl lift design to raise and secure the bowl, and its commercial style attachment power hub is compatible with all KitchenAid attachments for added versatility. For additional security, speed control protection reduces the risk of turning on the unit during cleaning. The KSM8990DP NSF 8 qt. 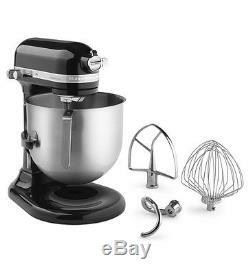 Commercial stand mixer comes with an 11 wire whip, flat beater, spiral dough hook, and bowl, all constructed of durable dishwasher-safe stainless steel. Overall Dimensions: Width: 13 1/3" Depth: 14 2/3" Height: 16 1/2. ATTENTION ALL CUSTOMERS: ALL ELECTRONIC ITEMS ARE 110V. 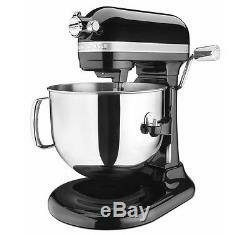 The item "KitchenAid Commercial 8-Qt Bowl Lift NSF Stand Mixer KSM8990OB 1.3HP Motor Black" is in sale since Monday, December 23, 2013. This item is in the category "Home & Garden\Kitchen, Dining & Bar\Small Kitchen Appliances\Countertop Mixers". The seller is "usa-world-sales" and is located in WE COMBINE SHIPPING YOU SAVE $$$$$$$$$. This item can be shipped to United States, Canada, United Kingdom, Denmark, Romania, Slovakia, Bulgaria, Czech republic, Finland, Hungary, Latvia, Lithuania, Malta, Estonia, Australia, Greece, Portugal, Cyprus, Slovenia, Japan, China, Sweden, South Korea, Indonesia, Taiwan, South africa, Thailand, Belgium, France, Hong Kong, Ireland, Netherlands, Poland, Spain, Italy, Germany, Austria, Israel, Mexico, New Zealand, Singapore, Switzerland, Norway, Saudi arabia, Ukraine, United arab emirates, Qatar, Kuwait, Bahrain, Croatia, Malaysia, Brazil, Chile, Colombia, Costa rica, Panama, Trinidad and tobago, Guatemala, Honduras, Jamaica.